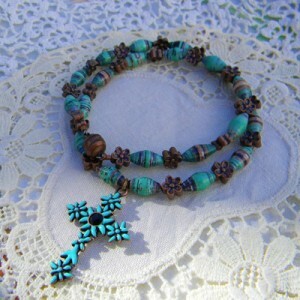 Turquoise color cross can be found at Michael’s Jewelry Aile, it will look nice with any of your turquoise color paper beads. You always hear me talking about my finds at Michael’s, I just find the inexpensive beads and findings they carry to be a great accessory with paper beads. All you need is to learn basic stringing technique and you can make any necklace or bracelet with a beading wire, crimp beads and a clasp. Just beautiful! Love the colors together! This is gorgeous! Love, love, love it!!! It’s really beautiful. Love the colors. very beautiful. I don’t know if you have them on the West Coast, but we have Dollar General stores here that have a good selection of inexpensive jewelry. I found some necklaces with shell pendants in a wide variety of colors for only $2 that would look great re-designed with paper beads. Just couldn’t decide which colors I wanted! Guess I’ll be stopping on the way home tonight…even with all of the snow we are supposed to get here in Virginia! 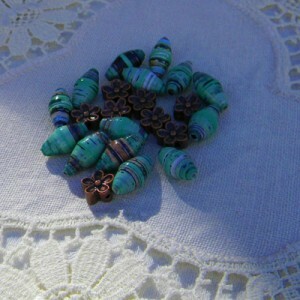 decidedly turquoise and bronze assemblies are my favorites! too beautiful! 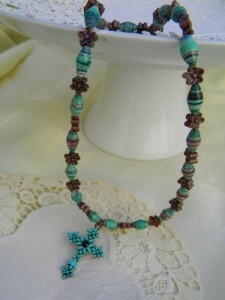 I love the idea of recovering part of other jewelry to blend with the paper beads .. this cross is particularly nice ! i love it !!! !